As such they are short duration technical plays. A “classic straddle” is a market neutral strategy in that it can profit when the market moves either up or down. In either case the premise is simple. Use a straddle when you expect a large and sudden movement of price but when you’re not sure in which direction this movement will take place. The straddle has two order-legs and each of these can trigger if the price hits that level. As long as you have the ability to go both long and short in a market at the same time, a classic straddle trade system can be devised. As I show later, there are workarounds when your broker has a no-hedging policy. In the article I look at ways of tackling the challenge of whipsaw. My Excel spreadsheet is also available for free download if you want to try out this strategy. The buy stop order will trigger only if the price rises to at least 1.10250. The sell stop order will trigger only if the price falls to at least 1.09750. In this example only one of my trades executes and this is the buy stop order. This happens because the price took more or less a straight upwards path. The order executes between ticks #1 and #2. The scenario is shown graphically in Figure 1. The next example shows a loss scenario. I am using the same starting point as the first example. But here the price initially falls then rises again so that both the buy and the sell order are triggered. Once both orders are triggered the system is locked in at the maximum loss amount. This happens at tick #6 as shown in the table below. My straddle leg was 50 pips. So in this case the system fixes at a loss of 50 pips and once both trades are open and remain open this cannot change. As the table shows, from tick #6 onwards the PL of the straddle system does not change, regardless of what happens to the price. Rather than executing both trades when the loss outcome is certain, you can perform a close-and cancel. As explained in my articles on grid trading, you can do this if the price is highly likely to meet both levels. This is done to save trading fees. Ideally we would not open the second order because the loss is already defined at this point. With close and cancel, the open position is closed and simultaneously the pending order is cancelled. This happens just before the trigger level for the second order is reached. Note though because the order must be cancelled a few points away from the trigger level, there is a small chance that the price will actually reverse. So overall the profits or losses using close and cancel will not be the same as a classic straddle, though they should be close. This “close and cancel” method is necessary if your broker prohibits hedging. This is because with no hedging rules (also called FIFO) it won’t be possible to open two opposing positions in the same instrument at the same time. One of the things that make straddle strategies appealing is that they have a well-defined risk and reward. This helps with the trade plan. Figure 3 below illustrates the various payoffs (click to enlarge the image). 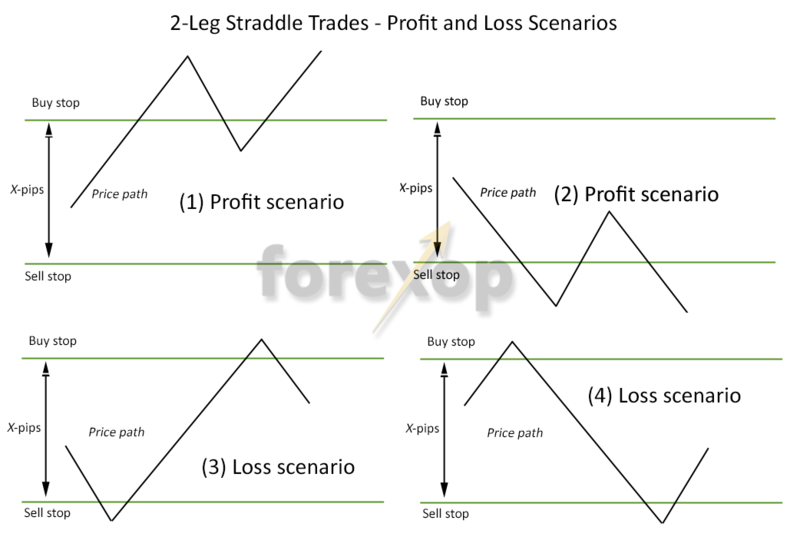 The maximum loss in the 2-leg straddle trade is the distance between the legs. So for example if the distance between them is 50 pips, this is the worst case payoff and the maximum risk. The worst case payoff happens when both orders are executed. The point about being clear and decisive is a tricky one. This is because important market events such as FOMC policy meetings and other high impact announcements often contain a lot of information. It takes a while for the market to digest and assimilate it all and this can cause a lot of volatility (see below) in the interim. If volatility is high you could find your orders triggering before the event you are trying to trade. It will also be harder to find meaningful levels on which to place the straddle. The biggest challenge in using the straddle trade is that of whipsaw. Whipsaw happens most often when the market is assimilating new information. It can give rise to ferocious swings of price that will trigger both sides of the straddle. It doesn’t just happen on news releases. Whipsaw is also very common on range breakouts and the breaching of important support or resistance levels. However the most aggressive movements are usually during important economic announcements. Whipsaw is the market’s way of denying traders easy money. It foils many strategies. There are several ways to deal with whipsaw. However they do require some anticipation. The first option is to use narrow profit targets on each of the straddle orders. This way, when whipsaw occurs there’s a higher chance that the profit target will be hit quickly. With strong whipsaw there’s also a possibility that both legs of the straddle can achieve a profit. This approach does alter the outcome. This happens because one leg of the straddle can close independently of the other. You will therefore have to place stop losses on both orders so as to limit downside. This technique is only suitable when you’re expecting some strong whipsaw movement. Examples of this are central bank announcements and sometimes on nonfarm payrolls. See Figure 4 (click to enlarge image). The sell limit order will fire once the price touches the upper leg of the straddle. The buy limit order will trigger once the price touches the lower leg of the straddle. This approach has a better payoff in highly volatile situations; namely when whipsaw price movement is expected. 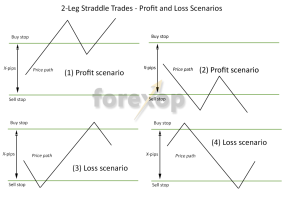 The reverse straddle system will have a maximum profit equal to the leg distance. Without stops it has unlimited downside. Therefore with this approach it’s necessary to use stop losses because the two sides of the straddle will no longer hedge one another. As I’ve shown above a 2-leg straddle is a simple way to trade any type of breakout event. Though as with most strategies the devil is in the detail. The first point to note is that if your broker prohibits hedging you will need to modify the strategy slightly. Generally, as explained above this can be overcome with only a minor change to the strategy. Secondly, you’ll need to check how your broker quotes prices around economic releases. In extreme cases, brokers will freeze quotes altogether, effectively barring trading around the release itself. In other cases, the spreads can be widened so much that it makes it difficult to make any profit. I’ve included the download link to my spreadsheet so that you can setup and test your own straddle trading strategy. 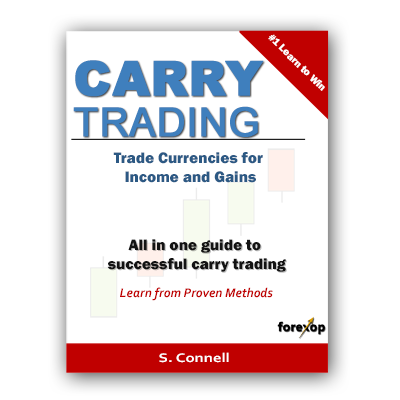 Finally, you can also create very effective straddle systems using options.